Are you wondering about fine restaurants and delicious food in the area?! Well, you will definitely be stunned by the type of food Kosovo has to offer including its tasty Turkish food, the incomparable salads, the amazingly delicious white cheese, and so much more. The majority of Kosovo’s restaurants possess an outstanding menu combining the local Kosovo cuisine with international and Turkish delights. Moreover, a good number of the restaurants additionally have various fine regional wines available. When it comes to the pricing, dining in Prishtina is exceptionally inexpensive with the main courses very frequently being under 10€. 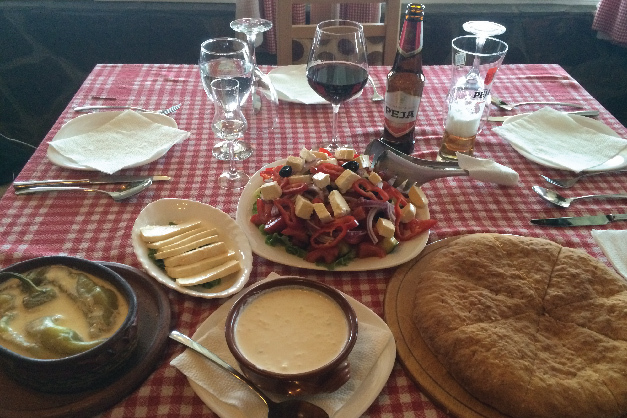 Prishtina is definitely varied deliciously as its food is more than often excellent. What may be even more, is that some of the best restaurants are located in places where you would never expect and don’t even look anything like restaurants from the outside of it. But once you taste the food, it’ll be a place you’ll always come back to. Home Restaurant is one of the best restaurant in the Prishtina, according to Tripadvisor. You can find world cuisine from steaks to sea food. Alban’s Restaurant is a really good place to go and spend time. It has a really good menu for food and drinks. Restaurant Perla has a nice environment. It is in Fushe Kosova and it is worthy to try the food there. It also has a good menu for food and drinks. Chick’n Pub is one of the best restaurants for chicken food. If you admire chicken food you should try Chick’n Pub. The food is really tasty there. Pizza Crust is a really good restaurant with a nice environment. Their pizza is really tasty and unique. It has a good menu and other food except pizza. Restaurant Trattoria is a good restaurant with different types of foods. You can find there fish, traditional food, steaks, pizza, pasta etc. You should try it. Shpija e Vjeter is a really good restaurant in the middle of the city. It has a very good environment. You can find there also different types of food, also they make some of the traditional food really good. The Olive tree is one of the restaurants which prepare some of the foods in brick oven , for example pizza, lasagne etc. The perfect place to have lunch in a quiet place, off the city and with a perfect view of nature. You can enjoy your food in an opened place with fresh air. It offers a great menu of different foods. Villa Germia is an old restaurant of Prishtina. It is in Germia from where it got the name. It is a really good place to enjoy your meal. Sorrounded by green nature it is the perfect place to rest your mind and body far from the car noise. If you are in the city and you want to try a good restaurant you should try Restaurant Pishat. It is in the middle of the city. With a very nice environment for both seasons and in summer it has a large open terrace. You can find very tasty and different types of food there. They make homemade bread baked in a brick-oven. Restaurant Liburnia is in Prishtina since 1992 and is one of the most tastefully decorated restaurants in Kosova.The restaurant serves both traditional, local stews and grilled meat recipes, and more international dishes such as pizza or the popular chicken rice with sweet chili. Buquku grill is a really nice grill house. You can find good prepared and really delicious meat. Grill Sarajeva is one of the famous grill houses in Prishtina. They have a big menu for meat there. It is really worthy to try the meat there. Oreksi is also a really good place to try the grill meat. It has very tasty meat-balls and other grill prepared food. Shabani Grill house is located in Nena Tereze square. It is one of the best grill houses in Prishtina. You can find there really tasty and inexpensive food. After that you can visit Kosova Museum which is 10 min far. Prizren grill house is located in Bregu i Diellit, it is and old grill house. It has the name Prizreni because the owners are from Prizren. They have tasty meat cooked in grill and you can also find some of the traditional food. Furra Lumi is an old bakery of Prishtina. If you want to eat some of the traditional foods you should go there and try them. You can find different foods in Tanore, like fast foods, burek, mantia, flija etc. You can also drink black tea there, which is also a traditional tea here. Kuzina is a really nice place and a different place from what we are used to see in traditional food restaurants. You can find there most of the traditional foods. It is really good prepared and tasty. When we think for traditional food, flija is the first one to appear in our mind. In Fli delivery you can have your flija delivered to your home. Te Nazi is also one of the famoust traditional foods in Prishtina. You can find a big menu of different foods like traditional, fast foods, risotto, chicken food etc. Tiffany restaurant is located just 5 min walking from the city center. They have excellent food and excellent service. You can eat there from soup to fish everything you want. Also if you want to try traditional food then you wont be dissapointed. Agora is really famous fast food place in Prishtina. Everybody loves Agora sandwiches. You can find really good food there. Abu Burger is a burger only fast food. It really has a tasty burger so you should try it. Burger Shop is also a burger only fast food. You can find different types of burgers there. Really tasty pizzas and different types of pizza. Except pizza you can also find good sandwiches there. Route 66 is known for good burgers. It has two locations in Prishtina and except burgers it has also other tasty fast food. It is worthy to try it. Extreme pizza is one of the famoust fast foods in Prishtina. It is located very close to the city and has a really good environment. They can also deliver the food where you want. You should try the “Samun” there because they do it very good. Sach pizza is located in 3 different places in Prishtina. They also do delivery if you want to try it from the home. Except pizza you can find different fast foods there. The most famous pizza place in America and now you can find it in Prishtina too. It is located near the city but it is opening in other places too. Everybody who tried their pizza liked it so if you didnt try, you should try it. If you love pasta then you can have it delivered to your home by Pasta delivery. They make a lot of different types of pasta and they do it really good. If you want to try Indian food then you can find this restaurant called Himalayan Gurkha and try it in Prishtina. It has really nice Indian prepared food. Nama Sushi as told by the name serves Japanese food. You can find there most of the Japanese food and it is really tasty.